mindful matters: Who's Your (Grand)Daddy? What do you call your grandparents? For myself, it was the traditional Grandma and Grandpa, with the notable exception of my paternal grandmother who was Gram. The only really different name that was ever used by family members of my own was Bobsha (I hope I spelled that correctly). It's the name some of my cousins called their father's mother. She was Polish, and the name means "grandma" in Polish. My own children call my stepdad Papa, but that's as unusual as the monikers get in my immediate family. However, in a world where we routinely come across more and more unique baby names, the traditional 'Grandma' and 'Grandpa' titles seem to fall a little short. So, just when you thought all you had to choose was a new baby name, there may be the added pressure of figuring out just what the right grandparent names should be, too. Just in time to save you, though, is The New Grandparents Name Book by Lin Wellford. 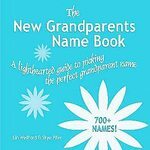 Containing over 700 names for the new grandparents, you'll have fun finding the perfect aliases for your folks and his. You could even wrap up this cute little 5"x5" book and give it as a gift to them to announce your new arrival. As for the Eternal Maternal Mama, grandparent status is still probably at least five years or more off (fingers crossed! ), but I currently am thinking I'd make a great Grammy.